I just received a photo of Julia Wisnosky (Vysniauskas) that made me think, “This must have been the most beautiful Lithuanian-American girl in Springfield.” Granted, that would have been some contest back in the 1920s and ‘30s, based on the photos I’ve seen. 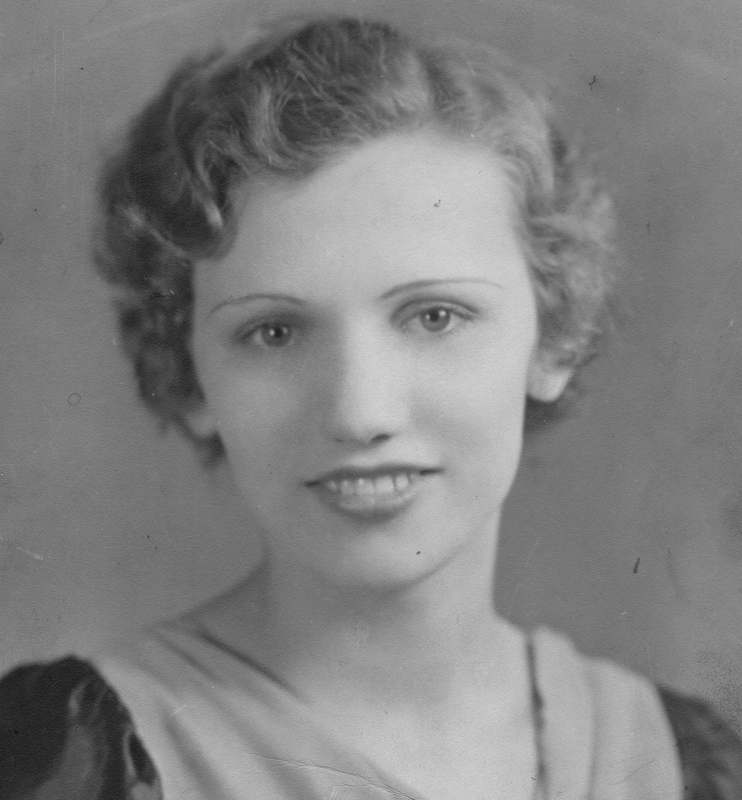 Julia Stockus (Wisnosky) at 16, 1933. First, there’s 16-year-old Ann Tisckos (later Wisnosky) in her Kasawich-Alane wedding party photo. And, then there’s the famous Anna (Gudausky) Frisch, daughter of the “Butch’s” Steakhouse family. Renowned in her time as the most beautiful Lithuanian-American girl in Springfield, Anna only burnished her legend by marrying “up” (and inter-faith) and going off to live in The Big Apple. However, in the presence of this portrait of the young Julia Stockus, I find myself transported back to a two-room home without indoor plumbing across from the state fairgrounds on Peoria Rd. And there, behind the gilded image, stands a disappointed young girl who has had to end her education in grade school so she can support her family by taking in laundry. How will she fulfill her dream of moving beyond the hard life of her immigrant parents? How will she even keep up with the other girls and boys she knows from school? According to daughter Janice (Wisnosky) Kansy, it’s such a blow that, even after catching up with night classes, Julia will always keep secret the fact that she never went to high school. 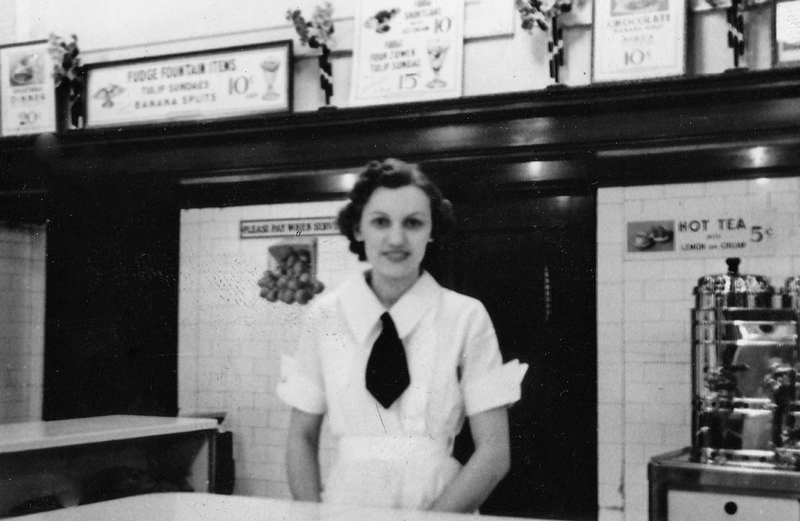 Julia behind the counter at the Woolworth’s soda fountain, downtown, Fifth and Monroe St., 1930s. A Challenging Start Julia’s childhood was difficult in many ways: Parents who drank too much. Appendicitis. A lightning strike on her home in which she was cut (but not on the face) by flying glass. And who knows how many other dangers to the safety and self-esteem of a young girl lurked in her rough immigrant neighborhood—along with the warm embrace of grandparents, aunts, uncles and cousins right next door and across the alley. Maybe all the hardship and roughness around the edges—outhouses and chickens in the backyard, hand-made material goods, public drunkenness and fights—are precisely what explain that veritable glamour shot of a 16-year-old girl with a far from glamorous life. 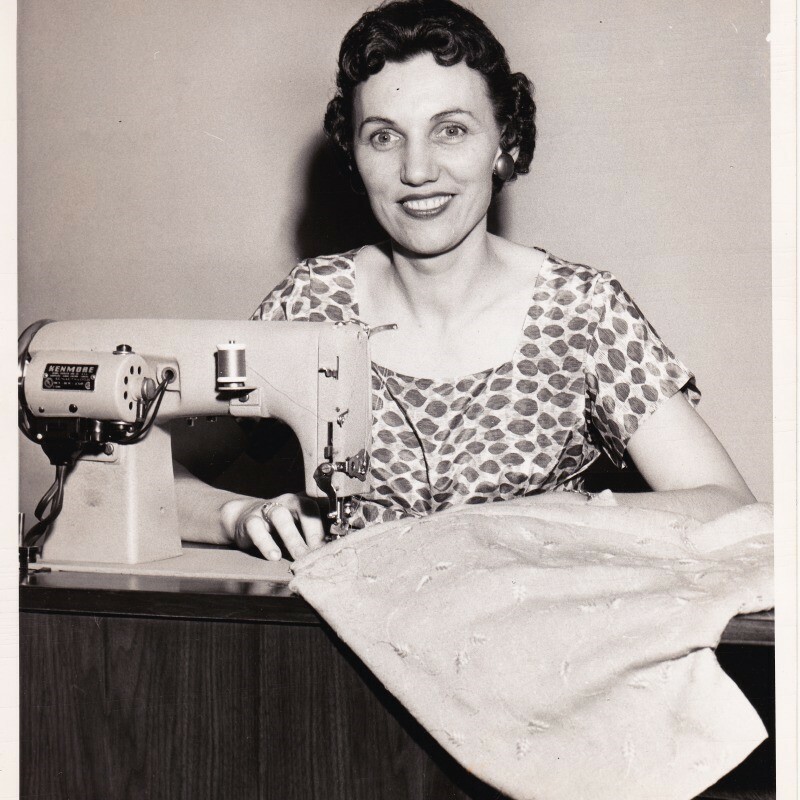 According to her daughter Janice, Julia grew up to be a talented seamstress, department manager, and founder of Springfield’s still-surviving Lithuanian-American Club. She also sponsored a Lithuanian DP family, was mother to an adopted daughter and two of her own biological children, and took in two World War II Lithuanian orphans (all while paying meticulous attention to her appearance, which is hard for me even to imagine). These details bring into focus a woman making her way down the paths of beauty and homemaking traditional for her time, while also nurturing a drive for importance in the wider world. 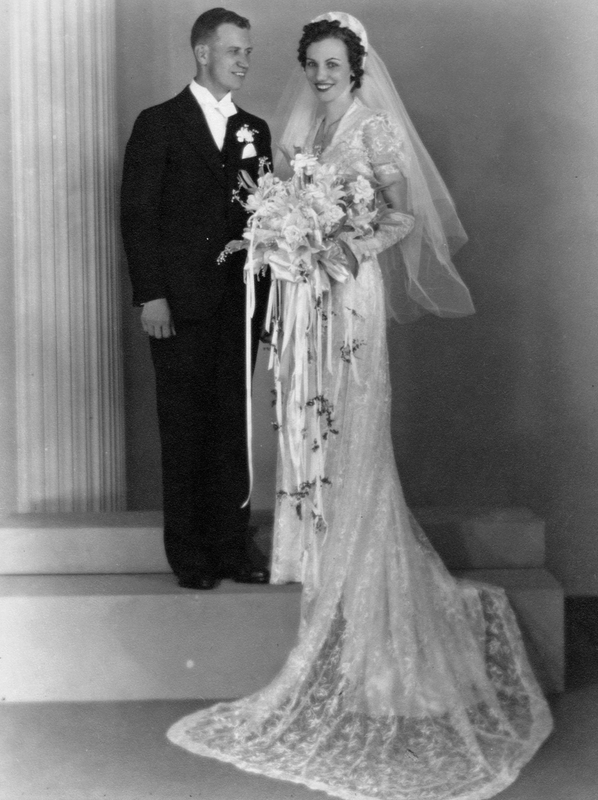 George and Julia (Stockus) Wisnosky wedding, 1930s. 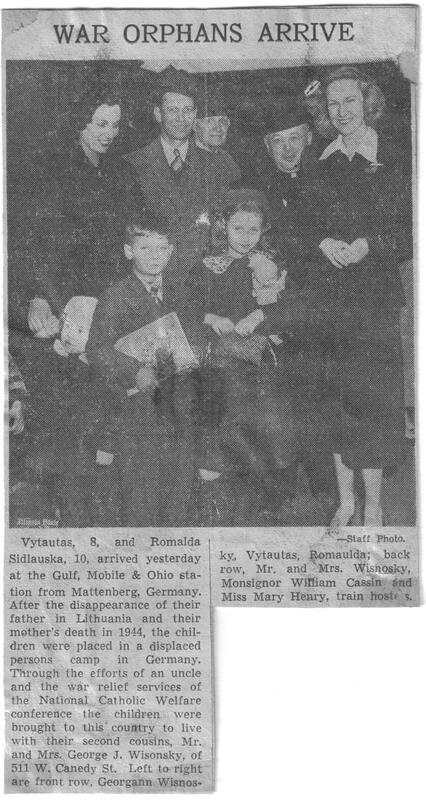 From Childless to Five Children Julia was born in 1917 in Springfield, the daughter of Lithuanian coal miner Anton (Antanas) Stockus and Verna Backovitch. She attended Ridgely Elementary School. Introduced by a cousin, at around age 20, she married George Wisnosky, Jr. (brother of Augie, Sr., Ann and Joe, who died of leukemia at 18). The wedding took place at St. Vincent de Paul Lithuanian Catholic Church. Julia’s father-in-law, George, Sr. was a founder of St. Vincent’s, and Lithuanian was the principal language in his home. Thus, by relating to her in-laws, especially her mother-in-law, Julia learned her life’s best Lithuanian, according to Janice. During her first 11 years of marriage, Julia did not conceive, and was told she probably could not. So she and George adopted their first daughter, three-month-old Georgeann, born in Pana. 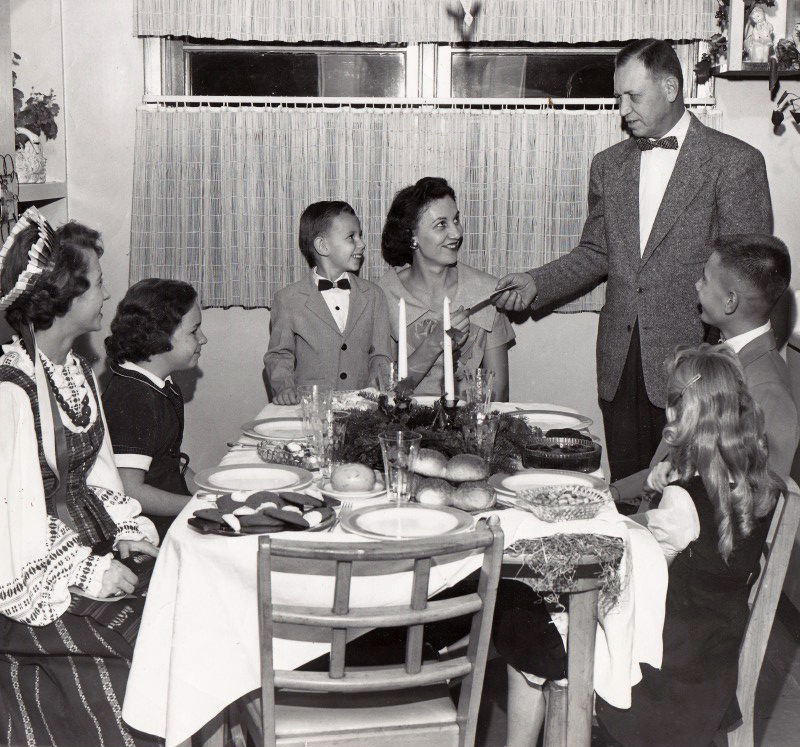 Just after World War II, they sponsored a DP family, the Sidlauskases, housing the couple with two boys in an apartment building they owned, probably on Lowell Ave. Hearing from the Sidlauskases about two distantly-related orphan children, Romualda and Vytautas (Vito) Sidlauskas, who were still living in a DP camp in Germany, Julia and George also arranged to take Romualda and Vito in. And, as you might guess, in almost no time, Julia miraculously conceived her first child, Janice, with whom she was pregnant the day she and George took little Georgeann to the train station to meet the Sidlauskas children. Soon afterwards, Julia also had a son, in the space of a few short years, going straight from a sentence of lifelong childlessness to house full of five children. Working in Town and on the Farm For most of their married life, Julia and her postal worker husband moved often. Janice remembers the family’s longest stint in one place: nine years owning and working a farm off Route 54 in Barkley (Sherman postal address). George Wisnosky, Jr. had wanted to be a doctor, but had had to quit U of I after two years to work off family medical bills. On the farm, Janice reports that George or Julia would work in town while the other worked the farm, caring for the animals: a horse and a goat, but mostly pigs and cows that were sold for slaughter. After George got disabled by arthritis, Julia worked full-time as a secretary at Grant Middle School. (I am almost certain Julia preferred working in an office, while retaining the guts and versatility from her youth to do manual labor when necessary.) Keeping up Appearances Janice recalls: “My mom was quite a seamstress. She made all our Easter clothes, even my brother’s suit. She was very into the home, re-finishing furniture and decorating, and she loved clothes. 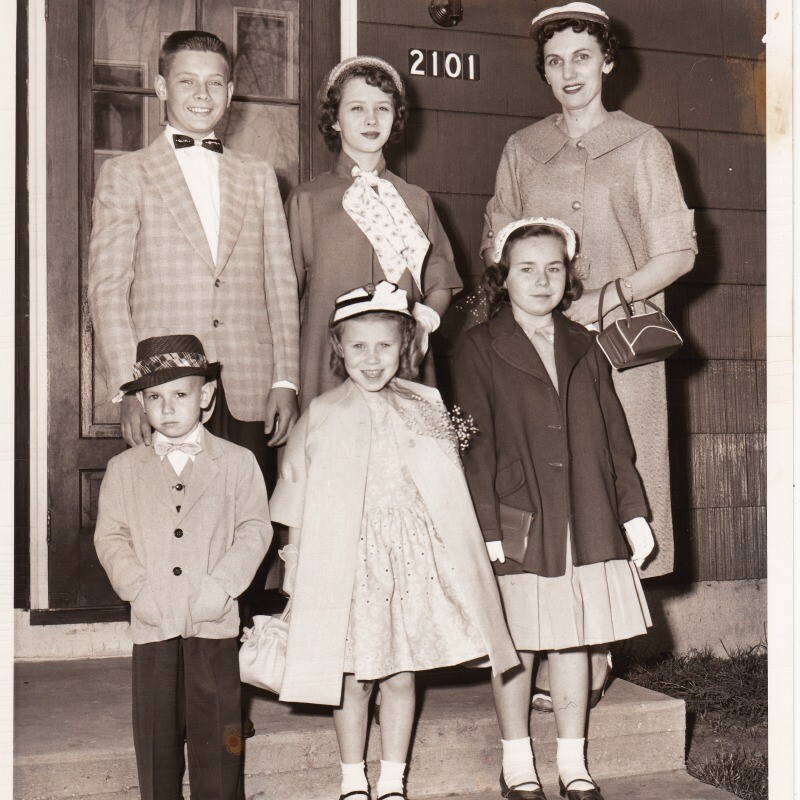 She really cared how she looked.” Here I think back to Julia’s parents’ generation, whose everyday immigrant reality of hard, physical work was redeemed by their Sunday fashions. And I get two completely opposite pictures of Julia in my mind: one in muddy farm clothes, and the other in this “Easter parade” with her children. Maybe these “down-in-the-mud” work-a-day identities were precisely what made dressing up necessary, a kind of antidote. 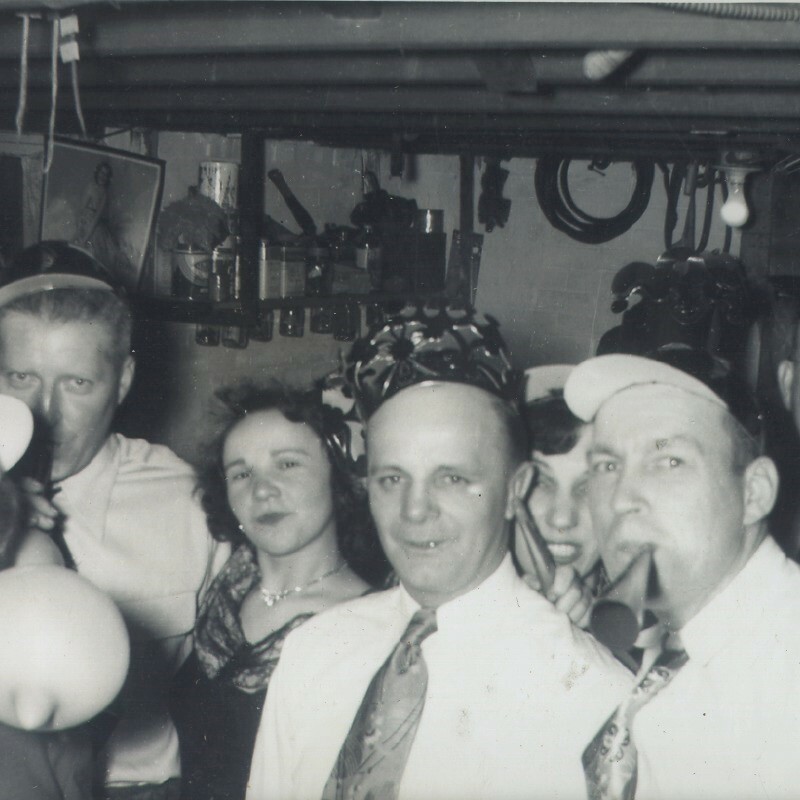 And, ironically, Americans only stopped dressing up to be seen in public, at church, movies, shopping, etc., when their lives became cleaner, wealthier, easier, and they no longer had so much about themselves to prove. Top from left: Vito and Romualda Sidlauskas, Julia Wisnosky. Bottom from left: Julia’s son, daughters Janice and Georgeann, 1950s. Lithuanian Club Founder Two of Julia’s proudest achievements outside the home are both mentioned in her obituary, dated August 11, 2004. The first was her rise to director of the audio/visual department at Scottsdale Community College in Arizona, where she and George initially retired. Her second achievement came after retiring from that college job in 1980. It appears that after a few years back in Springfield Julia needed a new challenge: helping to found a new Lithuanian-American Club as a social and cultural outlet for those who had once been members of St. Vincent de Paul Church. When St. Vincent’s was closed and demolished by the diocese over parishioners’ protests, those who still wanted to continue as practicing Catholics had no choice but to move on to other parishes. But they still kept their ethnic social ties from their St. Vincent’s days. That’s how enough of a core ethnic group remained, 16 years after their church’s demise, to form the new Lithuanian-American Club. A traditional Lithuanian Kucios dinner at the Wisnosky house, featuring evergreen branches under the tablecloth and Christmas wafers. Original glossy photo given to the family by the State Journal-Register. Although Julia was the one who made the call to Tom Mack and suggested others for that founding meeting in Tom’s office, she deferred to him as first president of the club, taking the office of founding vice-president. Over the years, Julia served the club in many roles, along with her daughter Georgeann and foster daughter Romualda (Sidlauskas) Capranica. “I remember buying her a corsage to wear to the first Lithuanian-American Club Dinner-Dance,” says Janice, who, as a molecular biologist, held posts at various universities and research labs out of state. Now a part-time teacher of chemistry and biology at a community college north of Seattle, Janice recalls how firmly both her parents clung to their ideal of an education. For her father George, this was manifest as a desire for his kids to earn degrees from the University of Illinois, where his dream of becoming a doctor had been cut short so many years ago. a meditation on what she was thinking behind those beautiful eyes. Thank you! Wonderful story. 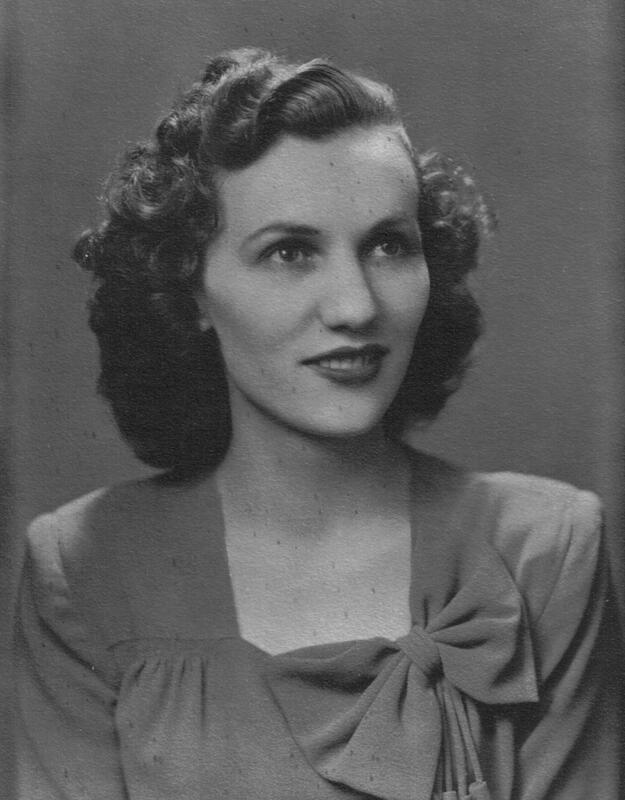 She was my mother’s (Ann Yanor) friend, as well as my Uncle Joe’s (think they dated and almost married). Her picture is in several copies in that box of pictures that you have seen. So enjoyed reading about her as my mother spoke of her often. Thanks for reading and caring, GeorgeAnn, Romualda, Maria!